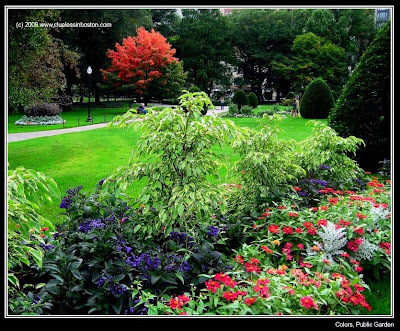 Late season flowers in the Public Garden match the changing foliage of the trees. Autumn is the best time of the year - beautiful colors, crisp air, and everyone enjoying the last glorious days before winter. Great photos. Love what you do with with these urban spaces such as Government Center or the Charles Street Station. Places difficult to photograph because of the vastness & the clutter. Somehow you capture what is essential. Love the lushness that's still left this late in the summer. Beautiful photo! A little touch of fall with the last vestiges of summer. Perfect.